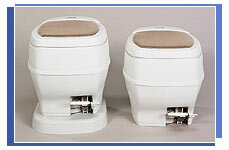 The toilet used on the Rialta is one device that seldom gives any problems. It is made by Thetford and is the "Aqua-Magic Starlite" low profile model which is described as a fresh water flush permanent RV toilet. This particular model is no longer shown on their web site so I believe that it is no longer produced but there are other replacement models. It was somewhat unique in that it was the shortest toilet ever made by Thetford at about 11" tall instead of the usual 14" to 17". Thetford does continue to market a riser for this toilet which will bring it up an additional 2-1/2" in height. Click on an underlined part number for service instructions related to that part. Can I use household products to deodorize or clean my RV's sanitation system? Are formaldehyde-based holding tank deodorants banned in some states? Are formaldehyde-based deodorants treatable in waste treatment systems? Should I use a special RV tissue? Why are specialty products sold separately instead of being included in the deodorant products? How are Thetford's holding tank products developed? Some products claim to be a top deodorizer and waste digester, while also lubricating valves, and cleaning sensors and the holding tank. Do these products really do all this? Why are label "warnings" on Thetford's packaging so prominently displayed? What happens if deodorants freeze? Can I safely dump my holding tank in my home septic system? Call Thetford's Customer Relations Department at 1-800-521-3032 to find out where the nearest of the 400 Thetford Certified Service Centers (shops which stock parts) are located. If the toilet isn't new, or is new but still doesn't hold water, there may be toilet paper trapped under the blade seal in a ledge of about 1.5 inches. A special tool to clean the groove is available from Thetford (for a price of $5.25 plus $3.50 for shipping and handling; 1-800-521-3032) and some dealerships. If this doesn't correct the problem on the Aqua-Magic Aurora, Galaxy and Starlite models, you may need to repair or replace the Flushing Mechanism or, depending on its age, replace the toilet. On the Aqua-Magic IV, you may need to replace the Blade Seal. Within about 10 seconds after flushing the bowl will normally fill from 1-2 inches to provide a "water barrier." Generally, the cause is the toilet's Vacuum Breaker. For Aqua-Magic Aurora, Galaxy and Starlite, repair or replace the Vacuum Breaker. For Aqua-Magic IV, replace the Float Assembly. The Vacuum Breaker is essentially a check valve or anti-siphon devise, which allows water to only flow one way. It is a plumbing standards code requirement that a Vacuum Breaker must be on all toilets. This prevents waste water from siphoning back into your fresh water. Start by turning off the water supply to the toilet (see your vehicle owner's manual for detailed instructions). Consult your Thetford Permanent Toilet Owner's Manual for more detailed instructions and illustrations. With the seat and cover in an upright position, quickly push toward the back wall and the hinges will pop out. If the toilet has been installed too close to the wall, it may be necessary to remove the toilet (see the question above and your toilet Owner's Manual for instructions). Your toilet, sinks and showers should all be cleaned in the same way: We recommend using a soft sponge or cloth and a high-grade, non-abrasive cleaner such as Thetford's Aqua-Bowl®. For parts and/or service - including those under warranty - contact a local Thetford Certified Service Center (CSC) or an RV Dealer. Or, call Thetford's Customer Relations Department for information at 1-800-521-3032. 3. The problem/reason for return. 4. Proof of date of toilet purchase. On Aqua-Magic Aurora, Galaxy and Starlite models, it's located behind the seat. Best visual access is gained by lifting the seat and lid about halfway up. If you seek unsurpassed deodorant performance - even in extreme weather conditions - and superior waste digestion, top-selling Aqua-Kem® is your choice. If you prefer a non-formaldehyde product that has excellent odor control, choose Aqua-Kem® Green. If odor control isn't vital and you'd like an enzyme-based product, Aqua-Zyme® is your best bet. Once you decide on the formula, select which type of dosage is right for you. All three formulas are available in liquid, and all but Aqua-Zyme are available in dry forms. The newest member of Thetford's holding tank deodorant lineup, convenient Aqua-Kem® TossTabs, is based on the Aqua-Kem Green chemistry. No! Use only RV specific holding tank deodorants and cleaners. "Homebrews" (a single or combination of household products) can damage your toilet - even possibly forming a dangerous, explosive mixture - and should never be used! No. Some campgrounds restrict its use, but this is the campground management's individual decision - not based on a state (or federal) law. Generally, a campground bans the use of formaldehyde due to misinformation about its treatability and biodegradability. Yes. They've been studied extensively, and independent studies substantiate that formaldehyde is readily biodegradable and treatable as long as the treatment system is properly sized and operated (for treating holding tank waste). RV holding tank waste is so concentrated (compared to household waste), it can cause problems in undersized or improperly maintained treatment systems even if no deodorants are present. Yes. Rapid breakdown of toilet tissue helps prevent clogs - an issue when dumping an RV holding tank. Many times more water is used in flushing a household toilet than a RV or portable toilet. Most households are connected to a city sewer with 3-foot diameter lines, while a RV's highly-concentrated waste is emptied through just a 3-inch diameter opening. Because they aren't needed each time the deodorant is added. Thetford's Drain Valve Lubricant, for example, soaks into the seals of the valve, providing lubrication for several dumpings of the holding tank. Adding it to the deodorant would increase the price of that deodorant and force the consumer to use an additive that is not necessary each time the deodorant is changed. Thetford has the RV industry's only full-time chemistry staff dedicated to recreational vehicle sanitation products. That Chemical Engineering staff, based in Ann Arbor, Mich., starts by researching new products. Often, new product ideas come from RV'ers seeking "a better way." The staff also formulates the new products, which then are extensively tested - often over many years in "the field." Thetford takes the time necessary at the testing stage to assure that a product is "as good as it can be" prior to its release to the market. It's easy to make product claims - far tougher to live up to those claims. What you describe may be a case of the old adage "If it seems too good to be true, it probably is." Be skeptical of holding tank deodorants claiming to "do it all" - especially if they "do it all" via a relatively small tablet and/or dosage and for a small price. We're glad you asked because package "warnings" are a safety issue the people at Thetford feel strongly about. After all, Consumer Product Safety Commission regulations exist to protect the consumer, something we're committed to. As part of that commitment, Thetford has a chemist whose area of expertise is governmental regulations. Through her efforts and others on staff, Thetford is careful to strictly adhere to CPSC regulations. Other companies may not be as careful - which may explain why the product "warnings" on their packaging aren't as prominent. Aqua-Kem is not "stable" in long-term freezing conditions. It will turn to a partial solid that doesn't readily dissolve. It can still be used, but you may notice a slightly reduced deodorant performance. All of Thetford's other liquid products will freeze, but are fine once thawed. And, the dry products are completely stable in freezing conditions. Extremely high temperatures can have an adverse effect on all products. It is best to store the products in standard room conditions. Yes - as long as your septic system is fully functioning, adequately sized and properly maintained. If you do, it's important to use only the recommended amount of deodorant in your holding tank and only empty when the tank is full. Also, because holding tank waste is very concentrated and breakdown takes longer, we recommend you dump only one RV holding tank in a home septic system per week.